The machines revolution: are humans obsolete? UCD 11/4/2014—“Igniting Genius: Lighting the Spark for All” was the theme of the fourth annual Conference on Integrated Computing and STEM (C-STEM) Education at UC Davis on November 9. Organized by the university's Center for Integrated Computing and STEM Education (C-STEM Center), the conference brought together teachers, researchers, educators, policymakers and industrial partners to share their experiences, best practices and ideas on the future direction of STEM education. 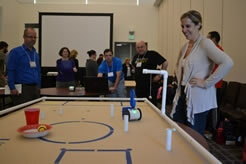 Two preconference workshops introduced K–12 teachers to the C-STEM curriculum and programming. UCSC 10/31/2014—Essential for the future of electricity is a “smart” grid, in which the energy distribution system is fully computerized, with sensors and wireless devices monitoring remote parts of the system and communicating with a central operations center. 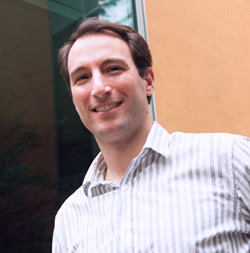 According to Ricardo Sanfelice, associate professor of computer engineering at UC Santa Cruz, automated technology can then adjust and control the components of the grid to improve its efficiency and manage the integration of renewable energy sources. The intermittency inherent in renewable energy sources such as wind and solar power poses a challenge for electric companies, which must provide a consistent power supply. Because smart grid technology could help meet this challenge, Sanfelice and his students are developing and testing theories about how to control the flow of electricity through a smart grid. 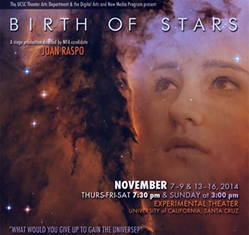 UCSC 10/22/2014—What does the birth and death of stars have to do with the lives of real human beings? How do we balance the joy and pain of life in a productive way? Does technology make us less than human…or something more? These mega questions are themes running through Birth of Stars, an original new play melding scientific data, digital projections, and a human story to explore the parallel between the lives of stars and the people who gaze up at them. Running November 7-16, it was a co-production of the Theater Arts Department and the Digital Arts and New Media Program (DANM) at UC Santa Cruz. The event was created by a research team of scholars, students, and artists led by Michael Chemers, director of DANM, Mark Krumholz, professor of astronomy and astrophysics, and Jim Bierman, professor of theater arts. The play combines live action with digital effects, including projections of simulations of stars forming in space. There is also a an interactive online component where the audience can learn about the science behind the play, plus get a behind-the-scenes look at the artistic process of creating. UCSB 10/14/2014—It’s already happening: Machines, spurred by massive gains in processing power and versatility, are poised to change life as we know it. Thanks to ever-improving algorithms and the ability to make a multitude of calculations per second, machines can operate autonomously and with precision and speed. More importantly, they can learn, and perfect in a few hours what a human being would need years to accomplish. Is it the stuff of science fiction come to life, with sophisticated robots that can do a human’s bidding? Is it the beginning of a dystopian future, in which people are the ones becoming obsolete? A little of both. In a talk titled “Engineering the Future: Feedback Control and the Coming Machine Revolution,” Raffaello D’Andrea—engineering professor, dynamic systems expert and new media artist—discussed the state of the technology, where it could be going, and how society might be impacted as machines get smarter and humanity becomes more reliant on them. “There are various technological and algorithmic and social pressures that are really causing this coming machine revolution,” But he expressed three concerns: robots increasingly displacing jobs, the use of machines in warfare (specifically the threat of continuing escalation between technologically advancing societies), and humans’ increasing hyperdependence on machines. Other concerns include issues of privacy rooted in the increasing use of camera-equipped drones, and environmental problems that result from the accumulation of discarded parts. No concrete solutions have been identified to address the emerging drawbacks, and D’Andrea argues that humanity will have to take an active part in dealing with them as they come. UCLA 10/14/2014—Just a stone’s throw from Silicon Beach (the epicenter of technology in Los Angeles) the Business of Science Center at UCLA, with support from the Center for Advanced Surgical and Interventional Technology and Center for Digital Behavior, is spurring innovation as the organizer of the second-annual Inventathon. The event is a unique 24-hour competition designed to develop solutions for pressing healthcare needs using the latest device technology and mobile applications for use in the healthcare field. 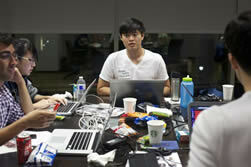 During the 24-hour competition, the teams will have access to tools such as 3-D printers, augmented reality glasses that can be used to help design and test applications for wearable devices, and special boards to help make mini computer chips, which are the brains behind the applications. UCB 10/7/2014—More than 1,000 inventive students from across the country inhabited California Memorial Stadium this weekend as they sought glory, prize money and the sheer thrill of solving problems together in a 36-hour tech event, Cal Hacks. Check out the action in this slide show.